What a tragic day! I got up 9am this morning, planning to go to the Glendi Greek Festival but felt asleep on my sofa at 10:30 because of the boring Windows 8 installation. The worst thing was that when I woke up, I found my neck was injured and can’t move around. It’s still very painful at the moment and have to finish the post while lying on bed. Anyway, missed the Glendi today and probably have to miss the CheeseFest tomorrow if there’s no sign of recovery by the morning. 😦 There was even more disappointment that a person left an abusive and irresponsible comment on my post on the Angus Pure beef. Anyway, after all these complaints, I’ll start today’s topic. We always say “fresh is best”. Yes, surely, fresh produces are the best in cooking and flavouring. Even wollies call them “the Fresh Food People”. However, in the other side of the world, European people, especially Italians, have shown us another scenario – “Preserved is Better”. Actually, when you look at our cuisine today, it’s heavily influenced by preserved food. Examples can be found in antipasti, cured meats and so on. I love having preserved fresh produces for antipasto and entree dishes and have made pickled sardines previously. 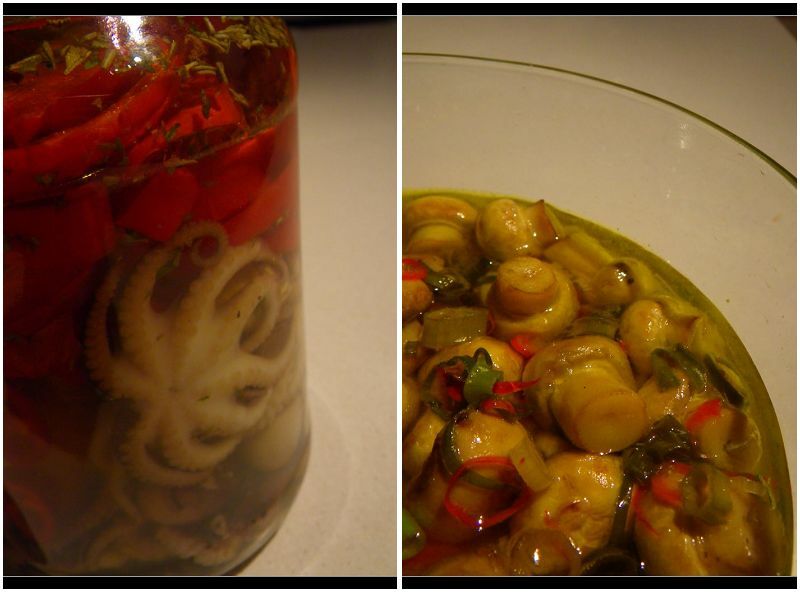 However, I decided to try something more common in our meal – the pickled mushrooms, baby octopus and grilled capsicums. 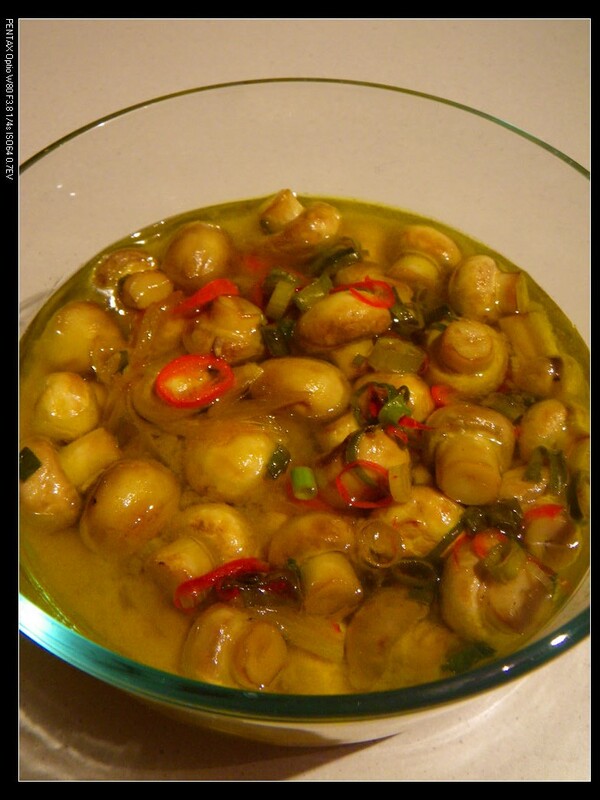 The pickled mushrooms are so easy to make. I made some alterations to the traditional method and it tasted exactly as what I wanted it to be. 1. Wash the mushrooms, drain and dry. There’s no need to peel the skins off. 2. Put a touch of olive oil in the pan and make sure it is just smoking before putting the mushrooms in. 3. Add a pinch of salt to push the water out of the mushrooms. Quickly stir fry the mushrooms until turn slightly golden brown. 4. Add the sliced shallots. Once the shallots are soft, add the white wine vinegar. 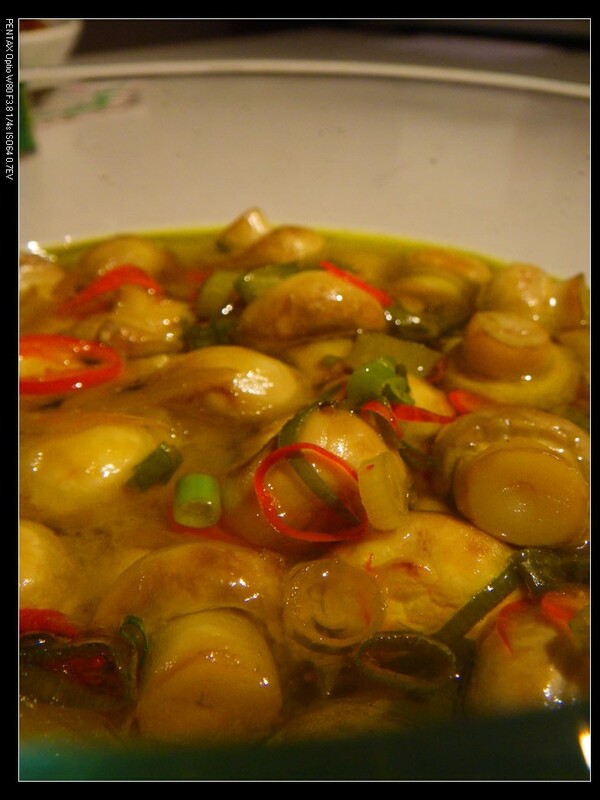 Make sure you add the vinegar around the edge of the pan so that all mushrooms can be immersed. 5. Now, stew the mixture with occasionally stir the mixture until all mushrooms have changed color – about 1 mins. 6. Turn the heat off and add chopped chilli peppers and spring onions. 7. Now the very last step is to add a small amount of extra virgin olive oil around the edge of the pan and stir them into the mixture. 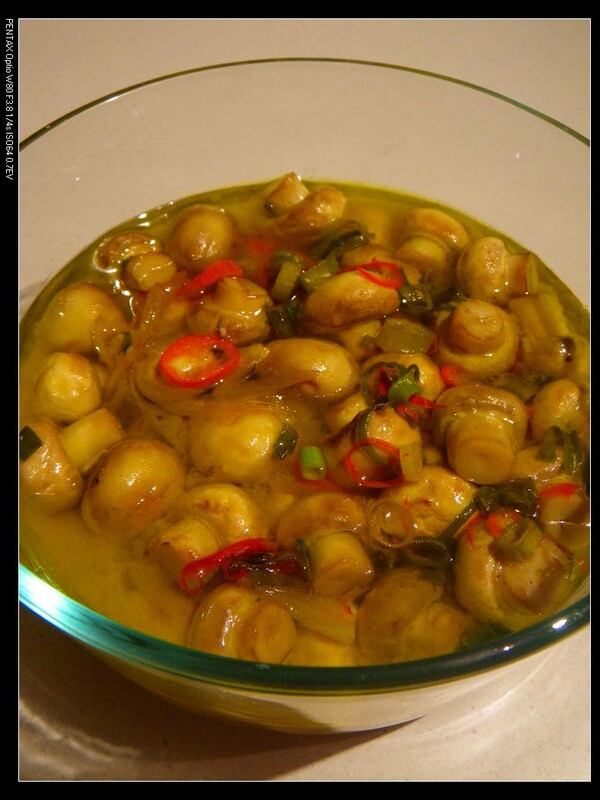 Be sure not to add too much oil because otherwise, the mushrooms are going to be very greasy after several days. 8. Transfer the mixture to a large glass bowl or container. Let the mixture cool and leave in the fridge for 48 hours before serving. Now the mushrooms can last over 2 weeks in fridge if you cannot finish them in one go. It makes a really nice weekend lunch side of antipasto dish! Enjoy. The baby octopus and capsicums can be pickled together as they can actually add flavour to each other and complement well. Some people likes pickling capsicum using sugar but I didn’t use it. 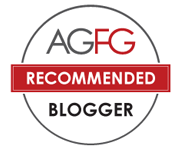 The flavour was more towards the sour and aromatic side of the story. 1. Cook the baby octopus – they can be poached in water with white wine, pan fried or grilled but just don’t add any salt. Make sure they are just cooked (so that they are still tender) before pickling. 2. Grill the capsicum slices until charred a bit – again, no salt required. 3. Find a bottle which can tightly fit the octopus and capsicum in without having much free spaces. Place the octopus tightly to the bottom half of the bottle. Sprinkle with the MasterFoods Mixed Herbs and add the garlic cloves, whole spring onion and chopped chilli pepper on the top. Then place the capsicum on top of them and sprinkle with MasterFoods Tuscan Seasoning. 4. 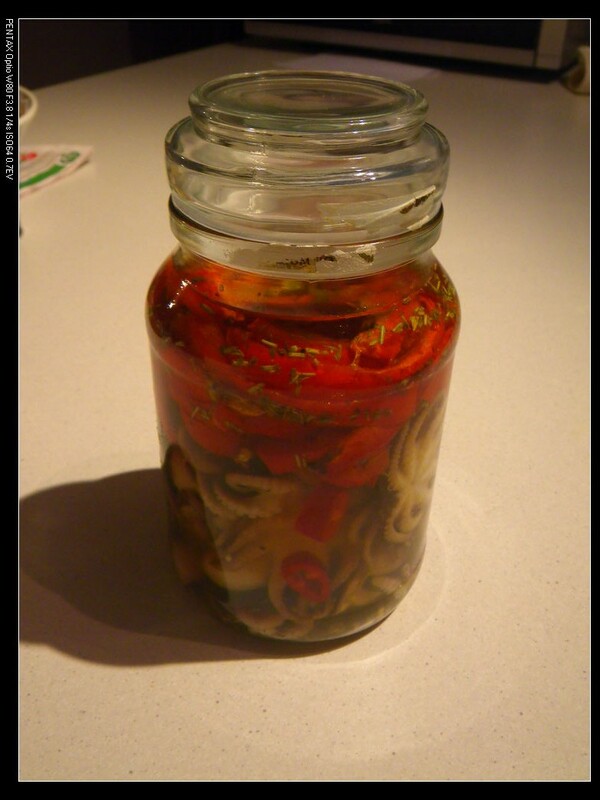 Pour white wine vinegar into the jar/bottle to 2/5 level. The pour the same amount of water into the jar (ie another 2/5 level). 5. Add olive oil on the top to make the other 1/5 volume. Do not stir the oil as it is used to preserve the space. 6. Seal the bottle and leave in the fridge for at least a week before serving. The pickled product can last 2-3 wks. 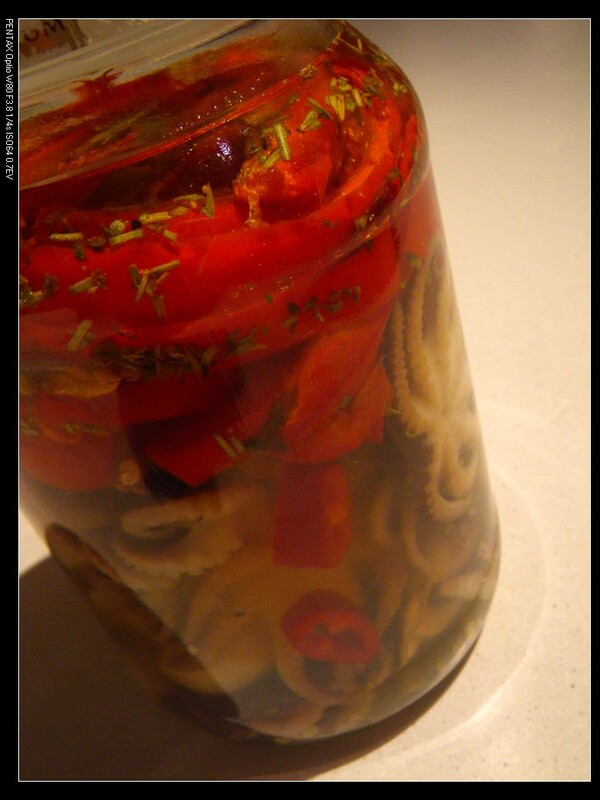 You may alter the recipe by adding feta cubes into the jar to add extra flavour or you can use octopus tentacle slices/pieces instead of baby octopus. Fresh herbs can also be used but I like using the dried ones cos more flavour can extract into the mixture during pickling. The sweetness and smokiness of the grilled capsicums can be fully extracted into the pickling solution and hence into the octopus. The sourness of the vinegar goes into the capsicums and the octopus well. Morish! I should have added feta cubes which can give more complex flavours. Enjoy! Looks yum! I’ll try them tomorrow. Thanks for sharing! No worries. Please let me know how you go. Oh my goodness! Why would anyone leave an abusive comment?? I am so sorry, it must have been very upsetting. Look after your neck 😦 Try some ibruprofen and an ice pack, often helps if there’s inflammation. That octopus looks divine, I haven’t cooked it in so long, your post reminded me how much I enjoy it. Cheers for that and take care. Thanks, Angela. I am still lying on bed but it’s getting better but unfortunately missed this year’s Glendi and CheeseFest :(. Don’t worry about the dude that left the abusive comment. I think he/she just pretended me as a Japanese and just trying to find somewhere to release his/her unused energy : P. Glad you like the octopus. ooo the mushy look delicious!! Woah! I really enjoyed this post. I always go to coles to buy them but I’ll give them a go to serve at my Christmas table. Oh, I can imagine! Yummo! Glad you liked the eggplant recipe! Let me how you go with these ones. Yes, absolutely, as long as they are corrected referenced and linked back to this site, you can reblog it.